Routers are the most popular power tools among woodworkers and DIY’ers for creating a decorative profile along the edge of a wood piece. With a router you can create custom house trim, add detail to furniture projects, or fashion shop-made picture frames. “Self-piloted” router bits designed for edge finishing have a ball-bearing wheel that guides the cutter along the edge of the workpiece. 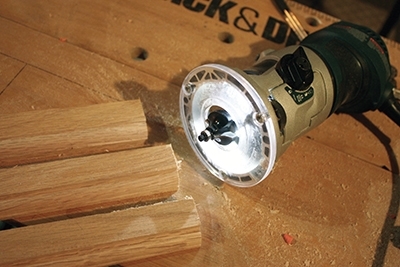 Using a router equipped with a round-over bit, you can ease the sharp edge of a table-top. With an ogee bit, you can give the edge of a wood strip the decorative swoop seen on baseboard and window trim. Routers can do more, however, than give shape to the edge of a workpiece. Bits that don’t have a guide wheel can be used to make cuts of various shapes within the field of a workpiece. 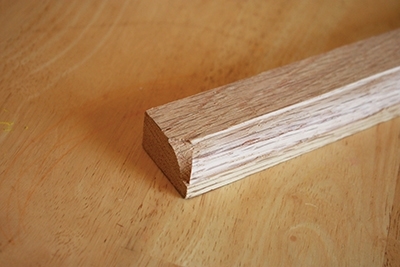 You can use a straight-cutting bit to rout a dado in a furniture panel for mounting a shelf. Or, use a dovetail bit to cut the pins and tails of drawer components to assemble classic dovetail joinery. You’ll find both pros and cons to the two main types of handheld routers: fixed-base and plunge style. 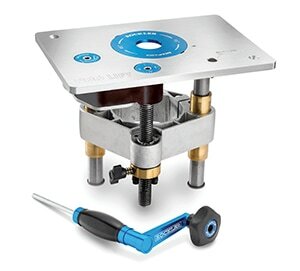 A fixed-base router has the tool’s base plate attached in a fixed position to the motor, which is a great setup for cutting a profile in the edge of a board, as well as any application where the tool cuts from outside toward the board. Fixed-base models have less moveable parts than plunge routers, which can make them easier to use with accessory guide bushings. The latest compact trim routers (also called palm routers) take advantage of the fixed-base design to cut down on tool weight, which makes them easy to maneuver. 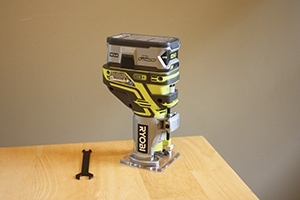 With an assortment of router bits at your disposal, an electric router can be used to give intricate detail to virtually any woodworking project. Plunge routers can do everything a fixed-base can do, and more, but they’re generally larger and heavier, and not as easy to use. The motor and cutter head slide up and down guide bars attached to the base. 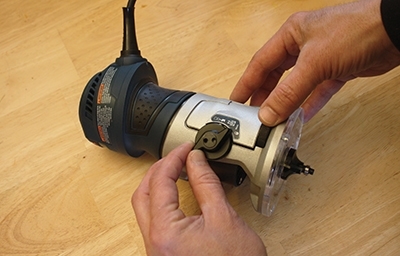 A plunge router’s primary advantage is its ability to begin the cut in the center of a piece of wood, where the router bit is lowered or “plunged” into the work piece. The plunging action makes the tools suitable for routing mortises and cut-outs in the center of stock. Plus, a plunge router can be used as a fixed-base router by simply locking the motor in the desired position along the plunge bars. For the startup DIY’er, EHT recommends beginning with a quality fixed-base router, which should tackle practically any trim application, as well provide the ability to cut rabbets and dadoes for furniture assembly. Over the course of many years tackling home-improvement projects, we’ve rarely found the need to plunge a router on a project. 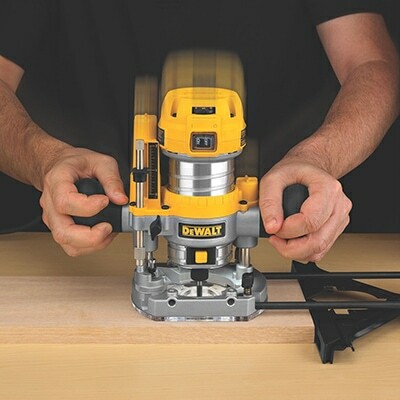 With plunge-style routers like this DeWalt DWP611PK, the bit can be lowered into a workpiece. A larger router might be necessary, however, for craftsmen who advance to more challenging woodworking projects. Whereas most trim routers are rated around 1-horsepower, larger routers are rated for about 2-1/4 horsepower. Whether in fixed-base or plunge-style configuration, these more powerful routers will be necessary to turn bigger bits (which have larger 1/2-in. shafts rather than standard 1/4-in., requiring bigger collets). These larger, more powerful routers are necessary for serious woodworking applications that use large shaper bits for jobs like cutting rail-and-stile cabinet door components. An easy-to-remove router base is a welcome feature when it’s time to change the bit. EHT recommends perusing the router aisle at the hardware show with an eye on bit visibility. This is an important feature when cutting to make sure the tool is routing as it should be. A guard window (which prevents wood chips from flying around) should afford unimpeded sight of the router bit. Some router models have two handles and a wide base, which allows for a large window. The advantage of the two-handled base’s wide footprint is its flat, broad bottom that helps prevent the router from tilting when cutting. 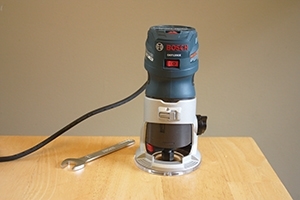 Look for a router with features such as easy depth setting, like this Bosch Colt router that uses a simple thumb wheel to make micro-adjustments to the bit. Many newer trim routers have a smaller base without handles. This design makes the router somewhat more susceptible to tilting, but a steady-handed operator can use these routers with only one hand, and visibility is a little more accessible as a result. Another nice feature is an integrated work-light that many routers use to illuminate the cutting action, which invariably occurs in the shadows beneath the motor. Variable speed control is a common feature among plunge routers, and on certain fixed-base models. This feature allows you to adapt cutting speed to the wood and router bit, and it keeps the speed consistent even when cutting fast into the grain. However, most trim bits spin at a high rate of speed, and variable speed is primarily handy for slowing the cutting speed when using large bits. Make sure the router has a fine-adjustment device that allows you to alter the cutting depth by just a hair if necessary. A guide fence for a router is another handy item that works just like a rip gauge for a circular saw. The fence helps to hold the router on a straight path while making grooves or rabbets parallel to the edge of the wood. The shank of a router bit is held to the router inside a hollow collet, which is tightened around the shank by the collet nut. Insert the bit as far as it will go, then back it out so the cutters are 1/8 to 1/4 inch away from the collet nut. Use a wrench to tighten the nut so it doesn’t slip during operation, which will change the shape of the cut and can be dangerous to the user. 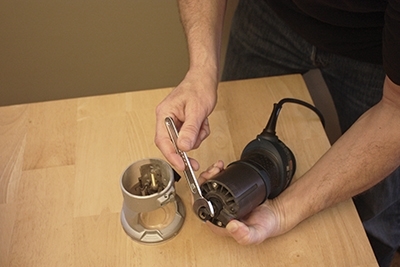 However, if the collet nut is installed too tightly, you’ll find it difficult to remove the bit after use. An LED work light is another helpful feature to aid cutting visibility. Some older routers require using two wrenches—one to hold the shaft and the other to tighten the collet—and carpenters would typically give both wrenches a “one-handed squeeze” to turn the collet an extra 1/8 rotation after snugging the bit with the wrenches. Newer routers require only one wrench, supplanting the second with a push-button spindle lock. Hold down the lock button while snugging the collet nut with a wrench, then give the nut an additional 1/8 rotation to secure it. 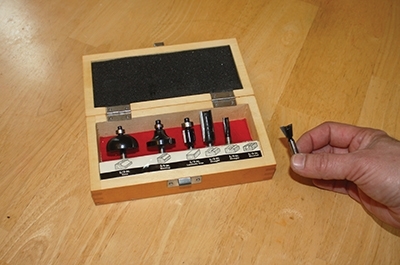 Tip: Router bits can be stubborn and get stuck, particularly if the router has an older collet that isn’t self-releasing. The problem with using pliers to remove them is you risk damage to the bit—and they’re not cheap. If you have a bench vise, like a Black and Decker Workmate, then unplug the router, loosen the collet nut and clamp the bit between the wooden jaws of the vise. Pull the router straight up while twisting it to slide it off the bit. 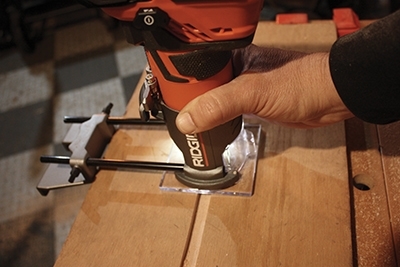 This brushless 18V router from Ridgid came with a guide fence that works like a rip gauge to hold the router on a straight path while making grooves or rabbets parallel to the edge of a workpiece. In general, it’s best to refer to the manufacturer’s suggestions for the recommended cutting speed of various router bits. The performance of the routing action is affected not only by cutter speeds, but also depth of cut, feed rate, and the hardness of the stock. In general, large router bits need to cut at a slower speed for safer operation. Smaller bits should spin faster. Refer to the manufacturer’s guidelines but treat the speed recommendation as a rough estimation—a good place to start—and then adjust the speed to optimize your results as you practice with the bit. This photo shows the importance of routing test strips before making production cuts. The router bit shown was used to shape all three of the molding strips—but notice how the thickness of the upper and lower lips change from strip to strip. 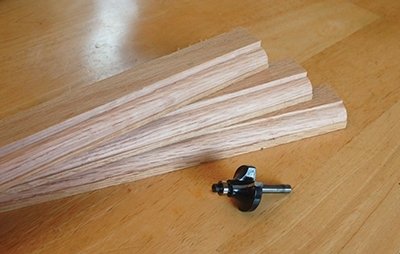 The different shapes result from slight changes to the depth setting of the router bit. DIY tip: Beginning and finishing a pass with a router can result in messy cuts where the bit enters and exits the workpiece. To solve this, the EHT staff typically routs a workpiece prior to cutting it to its final length, so we can trim off the messy ends as waste. So, you’re ready to start routing… The EHT staff highly recommends routing a few test pieces on scrap material before starting every project. Not only will this extra step get you familiar with how to handle the tool, but to get the exact shape of cut you want is not as simple as it sounds. Any slight deviation in the depth adjustment of the bit will translate to a different shape on your workpiece. For example, an ogee bit can rout a swoop in the edge of board, leaving a square lip at the upper and lower corner of the work piece. The size of those lips will change depending on the bit’s position in the router. Raise the bit, and the lower lip will get thicker. Lower the bit, and the upper lip will get thicker. It’s difficult to tell the exact shape of the cut you’ll get until you put the router in action on a test piece. You can then make micro-adjustments to the bit’s cutting depth until you get the desired look to apply to all your production cuts. 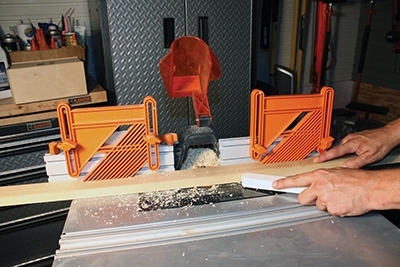 A router installed upside-down in a router table can provide a unobstructed view of the cutting bit, and also allow the user to rout small, intricate pieces that would otherwise be difficult or impossible to shape with a handheld router. A popular accessory for routers is a router table, which can convert your router into a miniature molding machine. You can fix the position and height of the cutting bit and pass stock through the cutter against a fence or jig, rather than running the router over the stock. The table gives the user an unobstructed view of the work, and makes it possible to rout small, intricate pieces where a router would otherwise be awkward to push over the stock. A rip fence, a miter gauge, and fingerboards can help you keep the workpiece in place on the router table during operation. 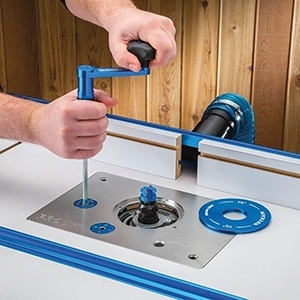 Designed for use with Rockler and Bench Dog router tables, the Rockler Pro Lift makes height adjustments and bit changing faster and easier than ever. Raise your router fast with the Quick-Gear, then downshift to the precision gear for fine adjustments. With a push-button release, the Snap-Lock insert ring allows for easy bit changes. The Pro Lift comes with one insert ring, but woodworkers will be able to buy an assortment of 5 additional insert rings. Coming soon, is a “Large Plate” version of the Pro Lift that fits 9-1/4×11-3/4-in. table openings (including Kreg, Jessum, Woodpecker and more). Visit www.rockler.com. The Colt trim routers from Bosch Power Tools have been popular for years, and the latest model is the GKF125CEN Colt 1.25-hp (Max) Palm Router. Driven by a 7.0-amp motor, the new model provides maximum comfort with an ergonomic soft-grip palm handle design. Impressive power allows the Colt to easily round-over edges and execute pattern cuts. It features advanced electronics with soft-start technology and variable speed (16,000 to 35,000 rpm), and Constant Response Circuitry helps maintain speed under load for consistent performance. The router includes the rugged 360° (non-split) PR101 Bosch aluminum fixed-base housing, which accepts bits up to 1-5/16-in. in diameter. The depth-adjustment dial (with both standard and metric scales) allows easy and precise adjustment, and LED lighting provides an enhanced view of the bit and work area. The router also includes a ball-joint cord swivel for easy cord positioning. Visit www.boschtools.com. The cordless and compact Ryobi ONE+ 18V Palm Router has micro-adjustment for precise depth control and cuts over 600 linear ft. per charge. With 29,000 RPM performance, it delivers fast, powerful routing for a wide range of trim applications. The quick-release lever for depth adjustment makes this router easy to use, and LEDs illuminate the work surface for increased cutting visibility, so your cuts are always precise. Visit www.ryobitools.com. 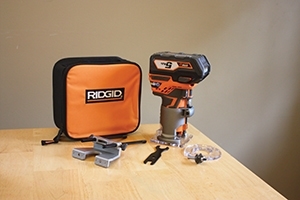 Eliminating the cord from the equation, Ridgid introduces the first Brushless 18V Compact Router (R86044B). The brushless motor delivers more run-time and a longer motor life for corded-like performance. Features include a variable speed dial (from 17,000 RPM to 25,000 RPM), a micro-adjust dial for easily setting depth, soft start technology, LED work light and a quick-release lever for easy removal of the motor housing from the base. Visit www.ridgid.com. 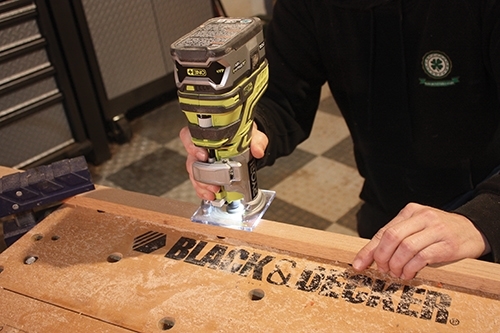 This dual option from DeWalt offers both router styles in a single kit. Combining power and performance with comfort and convenience, the DeWalt 1.25 HP Compact Router with Plunge Base and Bag has a durable 1.25-hp motor to tackle the most demanding applications. Features include variable speed control and a soft-starting motor with full-time electronic feedback to maintain motor speed throughout the cut. Dual LEDs and a clear sub-base ensure maximum visibility in operation. The motor can be switched quickly and easily between fixed and plunge bases. When used with the fixed base, an adjustment ring enables controlled bit depth changes to within 1/64 inch. The plunge base incorporates a fine-tune adjustment rod for precise depth setting. The large, low-pressure spindle-lock button allows for comfortable, single wrench bit changes. 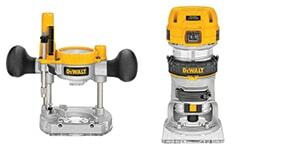 Visit www.dewalt.com.